The Dublin/Wicklow Mountains will never come top of the list for those seeking exposure to airy ridges or rocky scrambles. While exciting scrambling and climbing opportunities do exist, overall the hills and mountains of the group could largely be summarized as round lumps of bog. Many summits are bleak and bare, and amongst the bleakest sits Corrig. But just as many of the summits offer fantastic walking, so too Corrig offers an opportunity for an interesting and remote route that avoids the usual Kilbride Circuit approach. Start at a gate at O10923 19923 B at a sharp bend in the road. There is parking for one or two cars. From the sharp bend walk back north along the road for a hundred metres to the minor junction at O10876 20041 C. Turn left up the steep road and come to a house after another hundred metres. There is a gate on the left just after the house with a track beyond. Ask at the house about permission to enter the track. Permission was readily given to us when we spoke to the farmer. Follow the track for about 400 metres until you come to another gate leading onto open hillside. Stretching in front of you is the wide Glenasmole Valley that sweeps up to the highest point of Dublin – Kippure, about 4 ½ kms distant. This valley is little visited and is home to several babbling brooks complete with myriad mini waterfalls, a herd of wild goats and lots of deer. 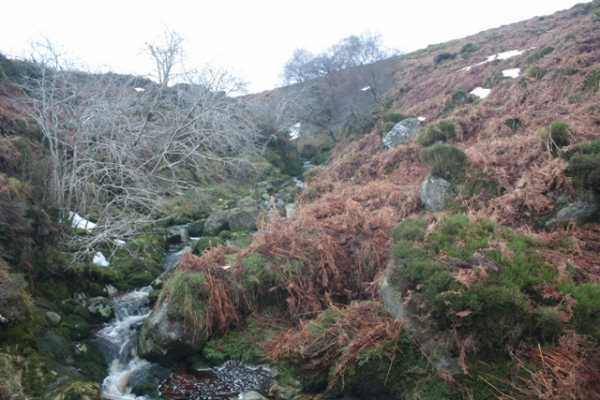 The valley is also home to the infant River Dodder which has its origins high on the slopes of Kippure. Glenasmole is also noted for the variety of goings – on that occurred during Finn McCool’s time about 1700 years ago. Stories of Dragons, Hairy Fellows and Greek Hags abound, as well as a mighty battle at De Dearga’s Hostel which was said to be situated in the valley. Read my Kippure walk guide no.102 in the Walks section for the details of these fierce deeds! After entering the open hillside continue south for about 500 metres. At about O10820 19362 D turn right and head west for almost two kms climbing 340 metres up to Corrig’s modest summit. You will need to cross Slade Brook at about O10240 19339 E, which will require care. Like other brooks in the valley, it is flowing swiftly downhill with narrow steep sided walls in places but safe crossing points can be found along its route. As you climb take in the emerging views as the wide bog sweeps east up to Glendoo Mountain and south to Kippure. Although the busy Military Road out of Dublin overlooks this valley, it is barely noticeable as it crosses high on Glendoo and won’t impinge upon your feeling of isolation.